We are coming Mr. Coaker and we're forty thousand strong. 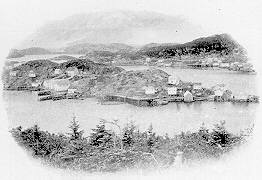 The Island's northeast coast had provided both Whiteway and Bond with strong electoral support from among the area's fishermen. Growing disillusionment by fishermen with the political and economic system enabled a new political movement to emerge in 1908 with the formation of the Fishermen's Protective Union (FPU) led by William Ford Coaker who in 1910 created a political party with deep organizational roots in the social life of the outports. Circumstances were favourable in 1908 for the formation of a fishermen's union, according to Coaker's biographer, historian Ian McDonald. "An unusual large catch coupled with disordered marketing produced a temporary but harsh depression that saw fish prices in many cases cut by half, leaving, thousands of fishermen angry and frustrated," McDonald writes. "However, that depression...was only the occasion for the union's creation, for the underlying tensions upon which it fed had long existed." In 1908 the 37-year-old Coaker was able "to channel the frustrated energies of fishermen and to shape their future course" (McDonald, "Coaker and the Balance of Power" in James Hiller and Peter Neary, eds., Newfoundland in the Nineteenth and Twentieth Centuries, Toronto, 1980, p. 155). 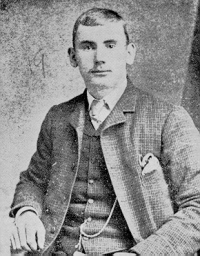 Born in St. John's the son of a carpenter, Coaker before 1908 had been at various times an outport mercantile clerk for a St. John's merchant, a merchant (who lost everything in the 1894 bank crash), a telegraph operator, a political supporter of Robert Bond in the 1897 election, and a farmer. From the late 1890s he operated a farm on an island near Herring Neck in Notre Dame Bay, where he read widely on the social and political issues of the day. 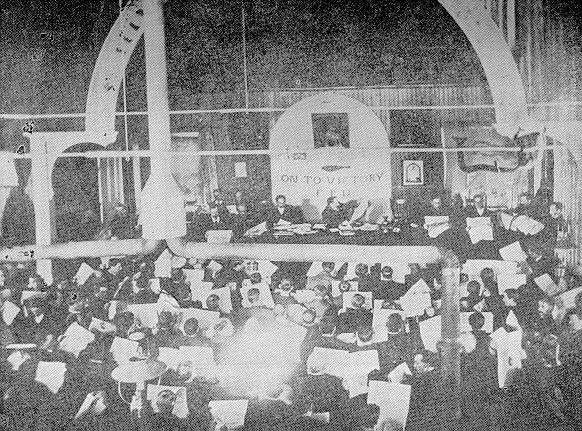 "Such a programme," Coaker told delegates to the FPU's annual convention in 1912, "should fill every toiler with enthusiasm and encouragement, for the operation of such a policy would completely revolutionize the fisheries and be truly a period of progress that places the toilers' interests above all others for the first time in the political history of parties in this Colony. Every toiler should be proud of such a policy and should never rest satisfied until it is in operation" (quoted in W.F. Coaker, ed., Twenty Years of the Fishermen's Protective Union of Newfoundland, St. John's, 1984 reprint of 1930 edition, p. 50). In his efforts to implement the FPU's political agenda, Coaker had to convince either Prime Minister Morris or Liberal leader Robert Bond to adopt such proposals as their own. Coaker did not envision the FPU's political organization, the Union Party, as assuming the reins of political power as rather holding a "balance of power" after the next general election. This political strategy, contained in section 63 of the union's constitution, stated that the Union Party "shall not hold more than sufficient seats to secure the balance of power between the government and the Opposition parties, and no Union member of the Assembly shall be permitted to hold his seat if he sits on the side of the government or opposition..."
The prosperity associated with the first Morris administration (1909­ 1913) had been, in part, the result of the coming into production after 1910 of the Grand Falls pulp and paper mill (for which the Bond Administration had been responsible for its establishment) and the resultant increase in the colony's exports. Local prosperity was also artificially-induced because of Morris' economically unsound, but politically popular, branch railway line policy. This policy saw the government spend $7 million for unnecessary branch lines--more than 50 percent than he had promised--to repay his political debts to the Reid interests, which had helped him in the 1908 and 1909 elections. By 1914 these expenditures had caused great concern among the Water Street merchants, who had rallied around Morris in the 1913 election to stop the political advance of the FPU, but whose support Morris now found wanting because of his mismanagement of the public finances. To pay for these expenditures, in the 1914 spring sitting of the legislature the Morris administration had imposed an increase of $650,000 in taxes that, therefore, effectively negated the cut in taxes made prior to the 1913 election. Such policies resulted in the national debt rising from $23 million in 1909 to $32 million in 1915. Morris's first administration also enacted legislation in 1911 providing Newfoundland's first old age pension scheme; any male aged 75 years and older who could prove they required financial assistance received $50 per year. The implementation of such a scheme had been discussed since 1907 when the Bond government appointed a royal commission to investigate old age pensions in response to a suggestion from A.B. Morine, the leader of the Opposition. Morine had suggested a pension of $40 annually be paid to men over the age of 65 years, rising to $50 at age 70 and $60 at 75. Morine's pension proposal would not be needs-tested. The commission collected the necessary data on various scheme proposals, but the commissioners did not make a report because of the political confusion surrounding the 1908­9 period. Both Bond and Morris made granting old age pensions a feature of their political platforms in both election campaigns. In 1911 Prime Minister Morris's government implemented a system that a Canadian expert on the subject has called the "first state-operated old age pension scheme in Canada, more than two decades before such a programme was adopted in any of the Maritime Provinces." Not only was Newfoundland's scheme based on limited funds, but throughout its history to Confederation with Canada, it was available only to men and "remained the most blatantly gendered scheme for the needy elderly in the western world" Successive governments had been able to control costs by "establishing a fixed limit to the total funds available for expenditure. Having determined that Coaker's party posed no threat to his own electoral re-election chances, Morris rejected overtures of support from the Union Party, which in fact posed a great challenge to Bond's Liberal Party. For the 1913 general election Bond reluctantly agreed to an electoral alliance with Coaker. The Liberal Party was allowed to run five candidates in union areas with the Liberal-Union alliance winning in total 15 seats, 12 of which were in union-dominated districts. Rather than lead the alliance in opposition, Bond instead retired to his farm at Whitbourne leaving the leadership to James Kent, his deputy leader. Coaker was not interested in being leader as he preferred to concentrate on union-related businesses, social, economic, and political reasons which gave rise in the early 20th century to the Fishermen's Protective Union. On the eve of the outbreak of war in August 1914 in Europe, the political fortunes of the Morris government had declined sharply in less than a year since its 1913 re-election. Indeed, Morris himself was pessimistic of his winning of another election, which would have to be held by the end of 1917. During the 1914 spring legislative session, the Morris administration found itself under a barrage of questions from Coaker and his fellow Unionist members in the Assembly. As Coaker noted in his maiden speech in the Assembly, it was not "by accident that we have come here. A revolution...has been fought in Newfoundland. The fisherman, toiler of Newfoundland has made up his mind that he is going to be represented on the floors of this House." During the session, the Unionists questioned daily government policies and programmes and, on occasion, forced Morris to adopt some legislation he otherwise would not have. 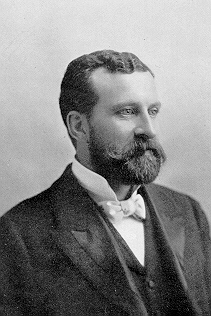 For instance, Coaker got Morris to pass legislation to improve working and living conditions for loggers and sealers; however, Morris used his majority in the Legislative Council to strip the legislation of any effectiveness. Concerning the need for elected road boards in the outports, Coaker got Morris to agree to a resolution which would see the necessary legislation enacted at the 1915 session, a promise Morris subsequently kept. It was against this background of growing public disenchantment with the Morris government that Morris in August 1914 agreed to a highly unusual procedure for administering Newfoundland's war effort--the appointment of a committee of citizens. The initiative for this notion came from Governor Sir Walter Davidson, a paternalistic and authoritarian representative of the Crown, but Morris quickly grasped this idea of having such a committee work under Davidson's guidance. On August 7, 1914, Davidson, with Morris' approval, had telegraphed the British government that Newfoundland would raise and equip a regiment of 500 men and increase the size of the local Royal Naval Reserve from 600 to 1,000 men. Five days later he and Morris organized a meeting of prominent St. John's citizens which, in turn, unanimously passed resolutions calling on the Governor to appoint a public committee to supervise and control Newfoundland's forthcoming part in the war. In effect, the Newfoundland Patriotic Association, as it was named, took on the responsibilities of government that in other countries were the work of department of militias. For three years, the Patriotic Association carried out this work without any legal authorization conferred upon by the legislature. The Association's central committee eventually consisted of over 250 members, most of whom were St. John's residents. There were also branches of the Association established in the outports as well, but throughout its existence the Association was perceived by the outports as a St. John's organization. The Association had the following sub-committees to implement its programmes: finance, reserve force, proclamation, musketry, physical fitness, nominating, equipment, transport, officers, selection, recruiting, non-combatant selection, forestry, employment, food, war history, war memorial, pay and pensions board, fund raising, and hospital (see Patricia O'Brien, The Newfoundland Patriotic Association: The Administration of the War Effort, 1914­1918, M.A. Thesis, Memorial University, 1982). In creating the Patriotic Association, the Morris administration hoped to remove partisan politics from the war effort and, thus, improve its own public image. To do so, the administration successfully first got Liberal, and then Unionist support for the Association. Morris hoped that this broad, political unity would also divert public attention from the widespread commercial and economic dislocations and inflation that would certainly follow as a result of war. It must, furthermore, be noted that the politicians, not only in Newfoundland but also in Europe, believed that the war would not last beyond the end of 1914. 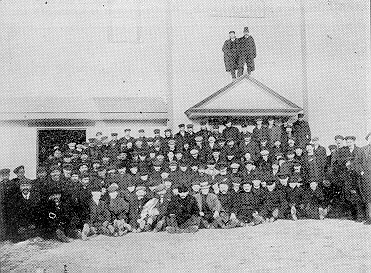 Consequently, the Morris administration saw the Association as a means of avoiding the slow, cumbersome, and expensive process of establishing the necessary government machinery for directing Newfoundland's war effort. Finally, since Morris was unwilling to enter into a coalition government with the opposition and thus put his administration under the direct influence of the Union Party, the Patriotic Association for Morris was a way around the problem of creating a unified political front. The Liberals proved receptive to this non-partisan approach and three important Liberals--leader J.M. Kent, J.A. Clift, and W.F. Lloyd, editor of the Evening Telegram-- joined the Association's central committee. As for Coaker, he initially opposed the Association's formation and demanded an immediate emergency session of the legislature to deal with economic problems in the fisheries. Specifically, he believed that Newfoundland's military contribution should be made through an expansion of the existing Royal Naval Reserve, for which the Imperial government would pay much of the cost. A land force he considered to be extravagant and wasteful and one that could only lead to increased taxation. Coaker also wanted fish price supports and public regulation of prices for provisions to control the cost of living, demands which Morris could not seriously consider because of Water Street opposition. By the time in September 1914 Morris did call the legislature together, the existence of the Patriotic Association was well-established and Coaker eventually supported the Association. Despite the existence of the Patriotic Association, public support for the Morris administration continued its downward slide. In early 1916 Morris sought to weaken the Liberal-Unionist opposition through the appointment of Liberal leader J.M. Kent as a judge of the Supreme Court. However, this tactic backfired as it drove Lloyd, the new Liberal leader, and Coaker into a more formal alliance on March 25 in anticipation of a forthcoming election scheduled to be held within the next year, an election they confidently believed they would easily win. In December 1916 Morris secretly got permission from the British government to extend the life of the legislature by one year if necessary. On May 25, 1917 Morris approached Lloyd and Coaker to form a coalition government out of the three political parties under his continued leadership. While the Liberal-Unionist alliance was preparing for the election due sometime in 1917, Morris took no measures to improve his own party's chances for the election. The only action he did take was to appoint in May 1917 a High Cost of Living Commission to investigate profiteering allegations against Water Street merchants, many of whom played prominent roles in the Patriotic Association. On June 15 Morris publicly announced his intention to have legislation enacted extending the life of the House of Assembly by one year. Faced with the reality of a postponed election, Lloyd and Coaker struck a secret deal with Morris for the creation of a coalition government, a deal of which Morris did not tell even his closest supporters of some its provisions. The essence of this deal was that the Liberals and Unionists would join with the majority people's party members to form a coalition cabinet composed of equal representation from all three groups. There was also a guarantee of an election in 1918. Morris would continue to be Prime Minister. The secret part of the deal provided for Morris's resignation as Prime Minister by the end of 1917 and his replacement by Lloyd. Morris also agreed to opposition demands for the establishment of a militia department to assume the work of the Patriotic Association and for the imposition of a tax on business profits. Thus, on July 17, 1917, the National government took office with Morris as Prime Minister and Lloyd and Coaker as influential cabinet ministers. Soon afterwards, Morris left Newfoundland to attend the Imperial War Conference leaving Lloyd as acting Prime Minister and, in effect, in control of government. One of the first acts of the National government was the passage of an extension bill, extending the life of the Assembly for another year. Other legislation provided for the creation of the promised militia department, the imposition of a profits tax act which imposed a tax of 20 percent on net business profits for the calendar year 1917 in excess of $3,000, and the restriction of the powers of the Legislative Council in money matters. Coaker was also able to provide a guaranteed price for fish to fishermen by setting a price and warning that the government would not issue insurance policies to exporters offering to buy fish below the set price. At this time, there was a shortage of local tonnage--the Water Street merchants had sold many of their ships to Russia, under the guise of helping the war effort, for lucrative profits--and merchants had great difficulty in securing private insurance policies for sailing vessels carrying cod to the Mediterranean markets. The National government also created a shipping department under the direction of John Crosbie to handle tonnage matters. As the end of 1917 neared, rumours circulated of Morris' pending resignation (Morris was still in England), but his people's party supporters dismissed them as idle speculation. Yet, the resignation did occur in late December 1917, with Morris accepting an appointment to the British House of Lords as Baron Morris of Waterford. However, Morris never got the appointment of Newfoundland High Commissioner to Britain, which apparently was part of the deal in setting up the coalition cabinet. When his former people's party supporters remaining in cabinet found out about this pending appointment, they vetoed the nomination out of anger in being duped by Morris, who had negotiated such a profitable exit for himself out of Newfoundland politics. The Lloyd National government, which took office on January 5, 1918, had to face the difficult problem of deciding whether to implement conscription to provide needed manpower for the depleted Royal Newfoundland Regiment. This was a problem which Morris had managed to avoid in the past, but on April 9, 1918, the British government informed Newfoundland that the Regiment would have to be withdrawn, if more recruits were not forthcoming. The Regiment was short its authorized establishment by 170 men and that it needed 300 men immediately and 60 per month thereafter. By April 1918 Newfoundland already had had over 8,000 men in all the services, while it rejected another 6,246 volunteers on medical grounds. The overall casualty rate for the Regiment was 20 percent, a figure more than double that for the Canadian army. The most famous battle the Regiment took part--and one that had the most disastrous effect-- was at Beaumont Hamel on July 1, 1916, when the Regiment suffered an appalling casualty rate of 90 percent. The Newfoundland government also found itself under pressure locally from various groups for conscription as well. In early 1918, for instance, the Loyal Orange Order, the Society of United Fishermen, and the Methodist Church Conference--all St. John's based--passed resolutions in support of conscription. The Presbyterians expressed similar support, while the Roman Catholic Church remained quiet on the issue, its silence being akin to consent. Within St. John's itself, there was general support both for the war and conscription. The outports, however, were a different matter and the people strongly opposed conscription because of the nature of outport economy and society. For outport fishermen, conscription meant a disruption in the fishery, since it would take badly-needed manpower from a fishery which was now experiencing considerable war-induced prosperity. The loss of men not only affected families but also whole communities, especially those communities dependent on the Labrador schooner for their economic survival. In the spring of 1918, then, the booming fishing economy was already short of manpower, and parents were reluctant to allow their sons to become volunteer recruits, let alone conscripts. Fish prices between 1915 and 1919 were 65% higher than their 1910­14 average (Hiller, "Newfoundland Confronts Canada," p. 447). Coaker was well aware of the strong outport aversion to conscription, but he faced strong pressure within cabinet to support conscription. His choice was to either support Lloyd or to withdraw the support of the Union Party from the National government. On April 13, 1918 Lloyd announced that his government would first hold a referendum on the conscription issue, a posi-tion Coaker reluctantly supported in public. However, the Newfoundland government bowed to British pressure and announced that conscription would be brought in without a referendum, a move it decided to take since it feared a referendum vote would go against conscription. On April 26 Coaker announced that he supported this new position by the National government, despite the many anti-conscriptionist messages that had flowed into FPU headquarters for the past month. The membership reaction to his decision was quick and swift. FPU Councils met and passed resolutions condemning Coaker's position, in which his members perceived him as favouring St. John's interests over those of the outports. In some Union homes pictures of Coaker were smashed, while in Union Council halls the instruments of authority were either returned to headquarters or turned against the wall. Coaker had decided to support conscription, because the National government had proven itself receptive to Union--sponsored measures since its formation in July 1917 and his continued presence in such a government he considered necessary to implement a FPU fishery reform programme. To soften the blow of conscription and legislation extending the life of the Assembly for another year, the Lloyd government also passed an income tax to cover those professional and middle class people whose incomes were not taxed by the 1917 business profits tax. It was Coaker's hope that the mere passage of the conscription act itself would stimulate increased voluntary enlistment by the May 24 deadline for the registration of conscript eligible men. This is exactly what happened. Six hundred men enlisted by May 24, thereby providing the Regiment with sufficient numbers to meet its needs until the end of September. While a campaign by war veterans no doubt had the desired effect in securing more volunteers, others enlisted voluntarily rather than wait to be conscripted. In the end, those who registered for service did not have to report for duty until September 1, 1918, because of the availability of a sufficient number of volunteers. Instead, they received a leave of absence without pay until October 15, by which date they received a further leave of absence until November 15 because of a local epidemic of influenza. With the end of war on November 11, the men were given an indefinite leave of absence. While none of the men ever saw active duty, the implementation of conscription did have serious political repercussions on the FPU and divisions developed among the members, some of whom would never hold Coaker in the same esteem as they previously had. While Coaker found the National government much to his liking and even some people's party politicians found they could work in harmony with Coaker, the opposition of Archbishop Edward Roche and the Roman Catholic Church to the FPU had remained unchanged. Although he had failed in his bid to prevent the creation of the Lloyd government, in May 1919 Roche was successful in having the government defeated in the Assembly. 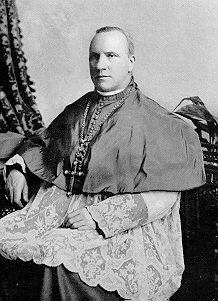 It was Roche's goal that the old alliance of Roman Catholics and the Liberal Party be forged once more under the leadership of the retired Sir Robert Bond. Thus, to retain Roche's support for his own future leadership ambitions and future support in Roman Catholic districts as well to win the support of the Water Street merchants, Michael Cashin, the leader of the people's party, decided to make a break with the government. In doing so, it was Cashin's hope that Roche's enthusiasm for Bond would soon subside and that Bond would not return to active politics. On May 20, 1919, Cashin rose in the House of Assembly and moved a vote of non-confidence in his own government. When nobody else stood to second the motion, Prime Minister Lloyd rose and did so, much to the surprise and laughter of other members in the Assembly. Lloyd did so presumably because he believed that Cashin did not really intend to bring down the government; rather, it apparently was Cashin's intent to have the motion not carry and Lloyd continue on as Prime Minister depending on his political survival on the people's party wing of the coalition and thus separate Lloyd from the Union wing. Cashin had counted, it seems, on the motion failing through some of the people's party members either abstaining or even voting against the non-confidence vote. Once the motion failed, Cashin then would be able to disassociate himself from the Lloyd government, while at the same time being able to defeat the government through the withdrawal later of support by the people's party. Thus, Cashin hoped to ingratiate himself with the Water Street merchants for having split with Coaker and, hopefully, impress Roche with his forthright stand in trying to defeat the Coaker-influenced National government. Lloyd's action, in any case, foiled whatever strategy Cashin had had in mind, for the Assembly unanimously passed the motion. 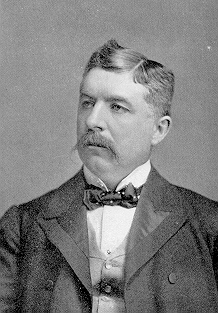 Governor Sir Alexander Harris then called on Cashin to form a new administration, which included former Liberal Albert Hickman and former Unionist John Stone. As for the remaining members of the Union Party, they remained a strong, united force under Coaker's leadership, while the Liberals were in disarray following Lloyd's acceptance from Prime Minister Cashin of a position as registrar of the Supreme Court. Leaderless, the Liberals spent the summer of 1919 awaiting a decision from Bond to their request that he return to lead them in the forthcoming general election. Hovering in the background to seize the mantle of Liberal leadership, if Bond remained retired, was a former Morris protege who in January 1918 had broken with the Lloyd national government, Richard Squires. Elected as a MHA for Trinity in 1909, Squires had lost his seat in 1913 and accepted an appointment to the Legislative Council and served as Morris' Colonial Secretary. Following his break with Lloyd, Squires had established his own newspaper in preparation for his leadership ambitions. Despite being a Morris supporter, local party affiliations were fluid enough for Squires to switch easily to Liberal ranks without his action creating a political backlash. Once Bond declared his intention to remain retired, "I have had a surfeit of Newfoundland politics lately, and I turn from the dirty business with contempt and loathing," Bond wrote to a Liberal power-broker who quickly threw his support behind Squires--Squires immediately set his plans in action. On August 21 he launched a new political party, the Liberal Reform Party, and entered into negotiations with Coaker for an electoral alliance, agreement finally being consummated on September 22.